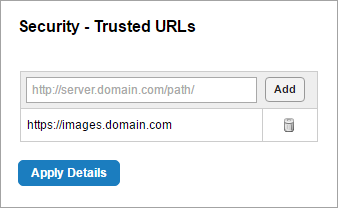 You can allow all your sites to access content from a URL using the Trusted URLs security feature. By default, viewers prompts users to allow or deny content from unknown URLs. If you trust a domain or specific URLs, you can add them to a white list of URLs that the viewer should always trust. For example, your layer attribute data may contain URLs from another one of your domains, and you want viewers to always trust links to that domain. From the Security & Data tab in Essentials Manager's header go to the Security > Trusted URLs page to configure trusted URLs. 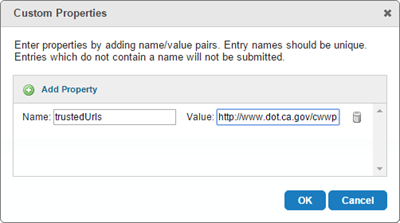 You can add an allowed value by entering it in the form's text box and pressing the Add button. Existing entries are displayed below the input form. To remove an entry you can use the Remove icon next to each entry. Once you have added values, use the Apply Details button to save the configuration. The specificity of an added URL affects whether a URL is trusted as a domain, subdirectory, or a single file. For example, if you only trust files from https://domain.com that are in the images/ subdirectory, you would enter the URL https://domain.com/images/ into the form. Trusts any file at the domain https://domain.com. Note that http://subdomain.domain.com would still not be trusted. Trusts any file at the subdomain https://images.domain.com. Trusts any file at https://domain.com within the subdirectory videos/. If a domain uses both http:// and https://, add both forms of the full URL as separate entries. This method of configuring trusted URLs is deprecated. We recommend that you remove any trustedUrls custom properties before adding URLs to the Trusted URLs interface in Manager. You can add the URL as a trustedUrls property to the site. Click the Properties link at the bottom of the page. Value: Enter the URL you want to trust. You can remove trustedUrls properties by clicking the Remove icon next to an existing trustedUrls property.